Rehearsals will start on Thursday 1st September 2011; watch this blog for more details! Tuesday 24th & Thursday 26th May - 1930 - Principle Tap Revision. 2015 - Company needed for Revision. Free IT course - CVS Tendring. Vision2learn is offering a new, flexible, free online IT course – Essential IT Skills (Level 2). Studying on vision2learn’s free online IT course will help you to develop new computer skills, train for work and achieve a UK-recognised IT qualification. Find out more and register for your free place today. Half Price Summer Courses at CVS Tendring! NOW ONLY £20 (or free for those eligible). Learn how to build on your skills and be a volunteer in your community. More courses are available including first aid, team work, customer care and food safety. Visit www.cvstendring.org.uk/training to download your copy of the training programme. Contact Richard at CVST for more information, richard.perkins@cvstendring.org.uk or give us a ring on 01255 425692. Training is open to everyone, not just voluntary groups or affiliated members, so if you know of anyone interested in any of our courses – friends, family members, neighbours etc then please feel free to pass this information on to them. 'High Society' wins 'Best Production of 2010'! Congratulations and well done to the Cast and Crew of our 2010 Production of 'High Society' because at the recent NODA East AGM not only did we win 'Best Musical of 2010' for District 11 but we also won the top award for 'Best Production for 2010'. This is absolutely fantastic news and shows all the hard work was well worth it. The above photo shows Lady Val Massey, Director; Edna Mountstephen, President; Nikki Mundell-Poole, Choreographer and Sam McCarthy, Chairman with the District 11 Shield for 'Best Production 2010'. The Awards are on display at the CMTS HQ. To commemorate this Award, the Management Committee would like to get together as many of the Cast and Crew as possible for a photo. This will be held in the near future, so please keep an eye on this blog for more information. Clacton-on-Sea Bowling Club are issuing an invitation to Try Bowls for Free at their Club opposite the Toby Carvery at Martello Bay, Clacton. Free coaching sessions are being held on: Saturday 30th April and Sunday 1st May at 10.00am, Friday 6th May at 6pm, Sunday 8th May at 10am and Friday 13th May at 2pm and 6pm. Bowls are available - all you need is flat shoes. 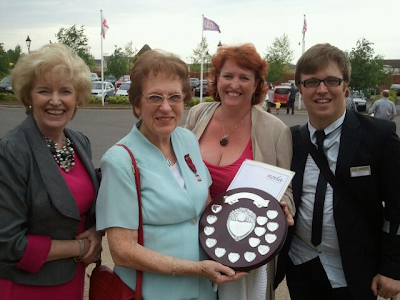 Tendring Volunteer of the Year. Do you know of someone who deserves recognition for their voluntary work? CVST is being sponsored by the Rotary Club of Clacton Jubilee to find the ‘Tendring Volunteer of the Year’ and the ‘Tendring Volunteer Group of the Year’. Awards will be presented at the CVST AGM and buffet lunch. CVS Tendring - Half Price Courses. The next course is ‘Introduction to Powerpoint’, Monday 9th May 2011 – NOW ONLY £10 (or free for those eligible). Create your own presentation. Formatting text, inserting images, applying design templates and transitions. More courses are available including mental health awareness, first aid, effective volunteering, confidence through acting, customer care and food safety. These events are very good for publicity and will help get Singin' in the Rain great audiences.